As the world’s largest business aviation show, NBAA Business Aviation Convention & Exhibition brings together current and prospective business aircraft owners, manufacturers and customers. With 27,000 industry professionals and more than 1,100 Exhibitors at NBAA BACE, it’s the place to get critical work accomplished. Ranked in the Top Ten (in at number 8 for 2015) of the Top 250 US Tradeshows, NBAA will be the most important event of the year for the business aviation industry. Let 2020 Exhibits be your source for the freshest ideas, custom exhibit rentals and strategy for NBAA success! Delivering powerful interactive and engaging brand experiences worldwide since 1987, 2020 Exhibits has the creative, operational and international expertise to bring your NBAA experience to life. 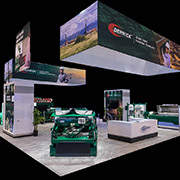 2020 Exhibits creates and designs custom environment exhibit rentals, including double deck and table top displays, that make our clients stand out in every tradeshow. 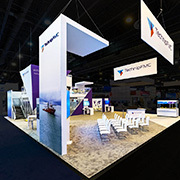 With the highest expectations, 2020 Exhibits specializes in custom inline displays, peninsula exhibits, tradeshow islands, and display portables. 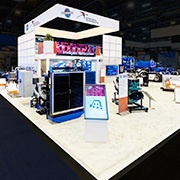 From total tradeshow marketing and event design and management including the design, fabrication and installation of award-winning custom NBAA tradeshow exhibits for business aviation leaders worldwide, to the latest and greatest A/V and high-tech technologies 2020 Exhibits has the in-house resources to deliver your comprehensive NBAA 2019 exhibit marketing program. 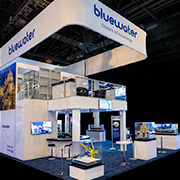 With one of the largest custom modular and portable tradeshow display rentals in the nation, featuring a wide range of award-winning double decks, custom booth fabrication and broad selection of custom rental exhibits, NBAA tradeshow exhibits and tradeshow rentals, 2020 Exhibits’ award-winning in-house design, graphics and large scale printing capabilities can simplify the process, providing the freshest ideas, high-impact marketing and dynamic power-generating tradeshow exhibits. From the show floor, your NBAA sales team can see and measure level of interest and true product focus for lead generation. Follow up can be immediate while utilizing 2020 Exhibits’ lead capture services, with the sales team no longer waiting for key analytics and information to make the call. Backed by powerful, real-time, analytics MEDIA SUITE, the most dynamic, all in one, easy- to-use interactive sales tool and engagement solution in the industry, is perfect for captivating and engaging NBAA attendees. Maximizing the power of dynamic lead capture and data, MEDIA SUITE’s customized survey technology captivates attendees and creates a more engaging, customized experience. With MEDIA SUITE as part of your NBAA marketing plans, your NBAA sales team has more time to engage and interact, which means deeper and more meaningful connections and attendee engagements. 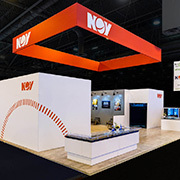 Let 2020 Exhibits raise the bar for your audio visual experience with our custom A/V creations and solutions. From 90″ ultra slim bezel to seamless stacking video walls and a fleet of LCD and touch screen monitors, iPads and tablets, our extensive audio visual display rentals selection and inventory is second to none. 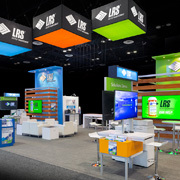 From interactive coffee tables and community interaction stations to hanging 180″ video wall displays, the sky is the limit – 2020 Exhibits A/V creates a unique audio visual exhibit experience for your NBAA tradeshow exhibits and events. NEED HELP PLANNING A TASTY NBAA EVENT?